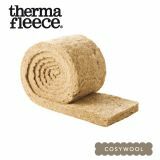 Looking for wool loft roll? Look no further! Insulation Superstore has a wide range of sheep’s wool insulation from well known brands such as SheepWool Insulation and Thermafleece, both well known and reputable brands with extensive knowledge of insulation and the benefits sheep’s wool loft roll can bring. What is sheep's wool loft roll? Sheep wool insulation is made solely from sheep wool fibres. 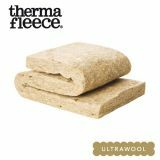 These woollen fibres can be either mechanically held together, or bonded using 15 to 15% recycled polyester adhesive. The wool fibres are then used to form insulating loft roll that can be installed in your loft quickly and easily. 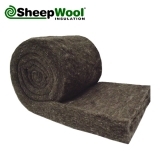 Sheep’s wool is one of the most environmentally friendly insulation options available. Sheep’s wool is entirely renewable, as sheep need to be sheared at least once a year, and sheep aren’t harmed or killed for their wool, so it will continue growing. Additionally, it doesn’t require any industrial processes to prepare it for use, and when disposed of it will decompose naturally. 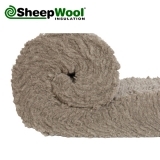 Sheep wool insulation is very well suited to wet or damp properties, because it is one of few forms of insulation that can absorb and release moisture without affecting its ability to insulate a property. Sheeps wool is a natural, sustainable, renewable, theoretically recyclable material and totally biodegradable that does not endanger the health of people or the environment.